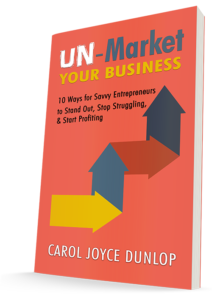 Today on The Writing Well I am delighted to introduce Carol Dunlop, a savvy marketer, master networker and author of UN-Market Your Business: 10 Ways for Savvy Entrepreneurs to Stand Out, Stop Struggling, and Start Profiting. Carol and I both have book titles with a similar play on words. My book, Moving to Atlanta: The Un-Tourist Guide, was featured last March on the author podcast, Write Books that Sell Now, that Carol hosts with two other dynamic Atlanta book marketing pros, Anita Henderson and Candice Davis. In the Q&A below, Carol shares some secrets that every entrepreneur can employ to get noticed and win new clients. I heartily recommend her book, which is available on Kindle Unlimited for free for the next five days only. Let us know what you think about her insights! Q. What made you decide to write UN-Market Your Business: 10 Ways for Savvy Entrepreneurs to Stand Out, Stop Struggling, and Start Profiting? Carol: The main reason I decided to write this book is that I wanted to kickstart my speaking career. I know it’s not an absolute requirement to have a book, but it puts me ahead of the other people who don’t have a book. Plus, having written a book gives me instant credibility and authority. Q. The title of your book is a bit of a twist — You are saying that it’s better to “un-market” your business than market it in a traditional sense. What do you mean by that? Carol: Yes indeed, UN-Marketing is how you take advantage of this new, exciting, and ever-changing digital economy to market your business successfully. It’s a way of using out-of-the-box, UN-thought-about, strategies that are simple and easy for you to make your own to turn friends, fans, and followers into paying clients. Q. What are a few surprising takeaways in your book that may surprise business owners? Carol: The overarching theme of the book is that marketing your business doesn’t have to cost an arm and a leg and doesn’t have to be a big scary thing. In actuality, all the strategies in this book are low- or no-cost, but they do require some time, on the business-owner’s part to put into place. I made sure I broke down the strategies into simple steps and included the reasoning as to why you are doing each one, what you can expect to get out of it, along with the best way to implement. Plus, I have lots and lots of extras, examples, and resources to help you with each step. Another takeaway is that you can use any or all the strategies authentically, meaning you can cater them to how you are, how you present your business, and how you want to be perceived. All the strategies are customizable so you can be true to who you really are and be successful doing it. Q. What was the most challenging and most rewarding part of researching and writing this book? Carol: The most challenging part wasn’t really the writing, it was after the writing; putting everything together. I did have an author coach, who helped me tremendously to get my thoughts and words across as I had envisioned, but putting the entire book together with the pictures, pull quotes, and how to do the things you don’t think about, like citing previous work, was quite challenging. As for research, the thing that helped me out the most was creating an outline first. It helped me to put my thoughts in order and in writing everything out. Once I created the outline, it was easy to write, because everything in the book was what I knew about or had previously done. The most rewarding part happened when I did research certain parts of the book and the research echoed what I had written or was about to write. It was kind of a “YEAH, you got this!” type of feeling. Q. Many authors say that writing a book is one-third of the work; the rest is marketing it. How are you promoting your book? Carol: My promotion strategy is based on involving my tribe and social media followers to help me. When I originally started thinking about writing the book, I wanted to get input from my peers, colleagues, and peeps to infuse into the content. I also wanted to show readers that I actually use the strategies that I talk about in the book, so they can see that these strategies really work. For instance, in Part 3, I went to HARO (which is the Strategy showcased in Chapter 12) and submitted a query to business leaders on what’s going to happen next in marketing in this new, digital economy. The responses are in Part 3, Chapter 15: What’s Next. I received the most awesome and intriguing responses. Not only is this great content, but I emailed all the contributors to let them know the book is complete and will be launching soon. This alerts them to the fact that other people will be seeing their comments and contact information and since people love to see themselves in print, will lead them to purchase the book and share it. Q. Any promotion best practices you can share with other business leaders thinking about becoming authors? Carol: Of course, I am going to utilize my blog and social media platforms, but I also created a podcast of the same name, UN-Market Your Business, where I share insights from the book and interview other business owners who exhibit UN-Marketing characteristics in their business. The thing is to get the concept out there, in front of people over and over again, in a way that “tickles the palette” and makes people think about their marketing strategies in a whole new way. That is UN-Marketing. When you are writing your book, think of a concept that you can make bigger than your book and infuse into the thoughts of others and you will have a success on your hands. Q. What other books have you written and what makes this book different than what you’ve crafted before? Carol: This is my second book, but my first solo book. In, my first book, Write Books That Sell Now, I was a co-author, but this time, it’s all me. It is very different to be a solo author instead of a co-author. In the first book, I didn’t do a lot, I submitted a couple blog posts, answered a couple questions, and wrote a few paragraphs. The editing and overall feel of the book was handled by someone else. But in this book, everything was me. Even though I had an author coach who helped me to stay succinct and relevant in my writing, because I tend to go off on tangents, it was still my writing. I made sure that throughout the book, my authentic voice, along with all my quirks, were showcased, even if that meant totally ignoring something my author coach, editor, or beta reader suggested. An energetic and personable networker, Carol J. Dunlop is among the elite in her field, her clients refer to her as an online marketing phenom, she is known as “The Online WOW! Strategist.” She is VP of Marketing and Communications at CSI Corporation, the company she founded more than twenty-three years ago with her husband Alvin. 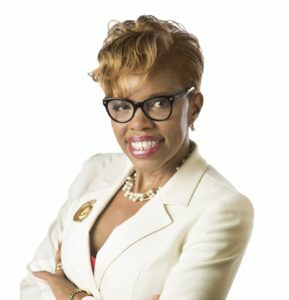 And is also currently serving as the VP of Marketing and Strategic Partnerships for ProWIN, a women’s business networking group in Atlanta. Carol also co-founded and formerly served as the marketing mastermind behind Write Books That Sell Now, an organization that helps aspiring authors to write, publish, and market their business-building book. Carol currently speaks to business owners about how “UN-Market” their business and convert their website into their business hub. She also shows them how to get the conversation started, grow brand awareness, build trust, and ultimately convert their fans, friends, and followers into paying clients through the strategies she’s used in her book, UN-Market Your Business; 10 Ways for Entrepreneurs to Stand Out, Stop Struggling, and Start Profiting. This entry was posted in Author Interviews, Brand Strategy, Social Media Tips and tagged Author, Carol Dunlop, entrepreneurs, marketing tips, podcast on October 31, 2017 by AnneWainscott.